Monster: Tastes like someone melted every flavor of Jolly Rancher ever conceived and then mixed it with an equal part off-brand cough syrup. It tastes sweet yet awful. It also was the harbinger of my worst energy day since the start of the experimentation — I was dead on my feet (or in my chair, I guess) at 11:30. (However, it should be noted that energy swung back up in the warm glow of a lunch at the Thai place off Muirlands.) Also, I’m not sure whether the Monster may be to blame for my only getting 5.5 hours of sleep Friday night — although in fairness, this lack of sleep didn’t seem to have a particularly damaging effect on Saturday’s activities or energy level. (OTOH, it might have had one had I spent all day Saturday going to meetings and answering emails rather than honing my furniture-making skills.) 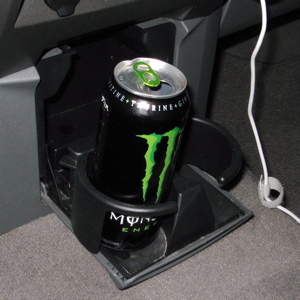 Finally, Monster has the plus/minus of including the word “taurine” prominently on the top part of the can, which, if glanced at too quickly, leads you to believe that the drink contains, rather, “urine”. And the flavor doesn’t do much to dispel that thought. 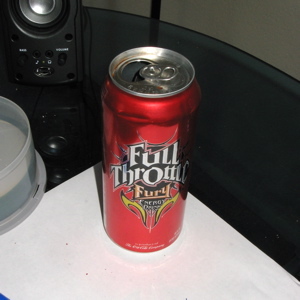 Full Throttle Fury: The taste is not awful — it’s like a very sweet orange soda with chemicals in it, which makes it probably the best-tasting so far. As for the effects, the Full Throttle Fury has been consumed on the weekend, so it’s difficult to compare apples to apples here. There was a slight energy lull midday yesterday, but it’s difficult to know whether that can be attributed to the drink’s potency or to the aforementioned short sleep night on Friday (or to a cumulative effect of multiple consecutive days of self-dosing). But between the Full Throttle and Friday, I was actually asleep by 12:30 last night — sans melatonin. So, yeah, I’m totally screwing up the scientific nature of this study. Sorry. Rockstar Juice — best energy, tastes okay, lists quantities of active ingredients.